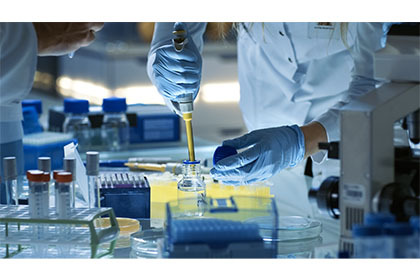 GTPases are in the limelight in biology and drug discovery because of their role in a wide range of cellular processes and function. They are highly conserved regulatory proteins involved in such diverse roles as signal transduction, protein biosynthesis, cell adhesion, membrane remodeling and trafficking, cytoskeletal reorganization, apoptosis, autophagy, and cell motility, to mention a few. GTPases have such extensive function in cellular operation that they are called master regulators of intracellular membrane traffic. Currently, more than 70 different types of Rab GTPases are known to exist. 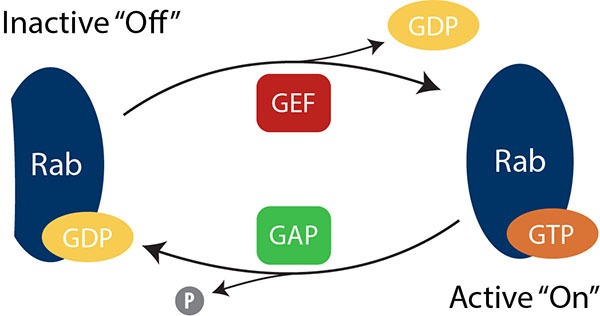 Rabs are similar to other GTPases as they all switch between two conformations, an inactive form bound to GDP, and an active form bound to GTP. GTPases are fundamentally a large superfamily of enzymes that can bind and hydrolyze guanosine triphosphate at the g phosphate bond in the presence of Mg2+ through a molecular switch that has been widely characterized. The GTPase activity is a function of binding and hydrolysis of GTP and takes place in the highly conserved G domain of the protein, common to all GTPases. This simple chemical reaction – amenable to determination of GTPase activity – is belied by the complicated functions of GTPases, and the vast interest of such enzymes. Included in the superfamily are both the GTP-binding proteins and the G proteins, the latter referring to the signal transducing heterotrimers. In recent years, much has been learned about the disease associations with GTPase dysfunction. Rab GTPases are members of the Ras superfamily of G proteins. Mutant K-Ras proteins are significant drivers of human cancers and may play a direct role in about 1 million cancer cases per year. Ras GTPases are important targets in drug discovery and development, as genetic alterations in Ras GTPase are very common in human cancers. The Ras oncogene has been an elusive target for drug discovery, challenges in targeting Ras GTPases are reviewed, and similar difficulties face the targeting of Rab GTPases. Rab GTPase dysfunction or mutation has not only been implicated in many types of cancers, but also in Parkinson’s, Alzheimer’s, and other neurological diseases. In recent years Rab5 has been added to the GTPases (like Ras) that have been implicated as a driver of malignancy and in other cancer-related processes. Rab5 as a drug target is also being investigated from observations that autophagy plays a role in neurodegenerative diseases, including Alzheimers and Parkinsons. It isn’t yet clear exactly how Rab may be directly involved, but many investigators have shown that Drosophila (fruit fly) models of amyloid toxicity may be helpful to study the role of autophagy in neurodegeneration, including Alzheimer’s. Recently, Dr. Chengbiao Wu and co-workers published an article in Traffic that discusses how Rab5 may play a critical role in mediating the dysregulation of several systems in Alzheimer’s disease. Rab5 mediated endocytic pathways are being studied to determine their role in neurodegeneration. The overarching goal is to validate Rab5 as a drug target and discover new therapeutics for neurodegenerative diseases. Other simple organisms can also serve as models for more complex creatures, as the GTPases are conserved and widely expressed. Hoepflinger and co-workers first detailed study of a conventional Rab5 GTPase in green algae using the Transcreener assay. These scientists confirmed their unidentified proteins – wild type and mutants – are indeed Rab5 GTPases. The authors used the activity assay with only 10 uM GTP and various amounts of their purified recombinant protein in 96 well plates. The fluorescent signal was measured and then converted using a standard curve. This robust assay is more sensitive than other colorimetric assays for GTPases, and is the only ‘mix and read’ fluorescent assay on the market. Their study illustrates the broad applicability of the Transcreener GTPase activity assay not only in drug discovery but in biological studies that deepen our understanding of the wide variety of function of GTPases. Sequence alignment algorithms may be used to form hypotheses that proteins are similar, and the actual assay confirms the enzymatic activity. Finding better inhibitors in the future will be paramount in finding treatments for disease. HTS compatible assays like Transcreener will continue to provide a useful tool at solving the dilemma. Rab GTPase family is surely not far behind the Ras GTPases in target validation and drug discovery. Bourne HR, Sanders DA, McCormick F. ‘The GTPase superfamily: a conserved switch for diverse cell functions.’ Nature 1990 Nov 8; 348(6297):125-132. McCormick, Frank ‘K-Ras as a drug target’ J. Mol. Med 2016 94:253-258. Chang WH, Jeong MS, and Jang SB, ‘Structure, Signaling and Drug Discovery of the Ras Oncogene Protein’ BMB Rep 2017 Jul; 50(7): 355-360. Banworth MJ, Li G, ‘Consequences of Rab GTPase in dysfunction in genetic or acquired human diseases’ Small GTPases 2018 Mar 4; 9(1-2); 158-181. WJ Chia & BL Tang ‘Emerging roles for Rab family GTPases in human cancer’ Biochem.et Biophys. Acta. 1795 2009 110-116. Xu W, Fang F, Ding J, Wu C, ‘Dysregulation of Rab5-Mediated Endocytic Pathways in Alzheimers Disease’ in press, 2019 Traffic.